Whether you are a small business owner or part of a big enterprise, get this: 80% of B2B leads come from LinkedIn. Before LinkedIn came into the picture, Facebook was regarded as the number one lead generation platform. However, over the last 24 months, this platform has been plagued with privacy issues since the Cambridge Analytica scandal and there is a growing dissent among the users. Earlier in March, there was a massive Facebook outage that lasted for a day. It affected Messenger, Instagram and the FB apps. Businesses weren’t able to run their ads and people experienced difficulties with the platforms. In short, LinkedIn marketing is the best approach to diversify risk of dependence on a single platform in 2019. If you want to successfully generate leads on LinkedIn, this article is for you. LinkedIn has undergone huge transformation since 2017 and is so much more than a resume repository. Today it is also a virtual professional platform where businesses generate leads and widen their business network. Users on LinkedIn are strictly there for professional purposes (unlike on Facebook!). And one of their objectives is to expand their network, identify prospects and eventually turn them into paying customers. If you own a business-to-business (B2B) or work for a B2B company, it’s the place to be – for networking with other professionals and getting in touch with decision makers to fill up your sales pipelines. I’ve written an in-depth article on how to maximise your business & career opportunities on LinkedIn. In this article, I’ll be focusing solely on this network’s business opportunities that host over 260 million monthly active users. LinkedIn drives over 50% of all traffic to B2B websites and blogs. More traffic means you’ll get higher visibility and more people check out your business offerings. This is the gateway of opportunity for potential collaboration and prospective clients! Not only that, if you plan to partner up with huge enterprises and isn’t connected with anyone in that space, keep in mind – 61 million LinkedIn users are senior level influencers. And 40 million have decision making power! Up next, I’m diving into the process of extracting lead opportunities from this social network. So, how do you actually generate leads from LinkedIn? Similar to all social media channels, there are the paid and the organic approach. 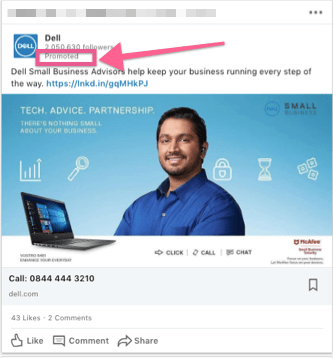 LinkedIn paid channels include sponsored posts, text ads and LinkedIn InMails. Text ads are on the right hand side of the newsfeed and it usually looks like this. At the top right hand corner of the ad, you’ll see the word “Ad”. It’s typically customized and you’ll likely see the ad addressed to you personally. Sponsored posts are similar to boosted posts on Facebook pages. Essentially you create a post and pay money to get the attention of a specific group of people you are not connected to. 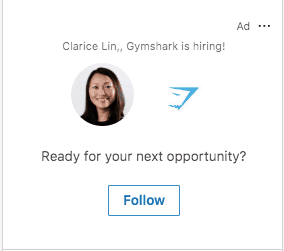 If you are connected to them, LinkedIn will make sure your boosted post show up in the newsfeed. You can spot them when you see the word “Promoted” in the post. Be prepared to fork out at least $2 per click and be as descriptive and specific as possible when defining your target audience group. The last method is using Sponsored InMails. If you aren’t connected to a person, you can’t send them private messages. Or if the person is beyond your third level connections (no mutual connections at all), you can’t correspond with them. A sponsored InMail is identified by the word “InMail” in bold right next to the profile picture of the person who sent you the message. If you decide on running a InMail campaign, this is how it works. A sponsored InMail campaign runs like an auction. You compete against other advertisers who want to send messages to the same group of people as you. Basically, you bid for the maximum amount you are willing to pay for each sent message. If your bid is lower than your competitors, then they will win the bid and their InMails will be sent to the targeted individuals (instead of yours). If you win the bid, you’ll only pay as much as the second-highest bidder. You’ll only pay when your bid is successful and your InMail appears in your target audience’s LinkedIn inbox. When you reach the bid and budget page of your campaign setup, there will be a suggested bid for reaching your target audience. If you are not ready to fork out the money for the paid approach yet, there is still the content marketing option for you. Grow your audience by publishing content on your individual profile and company page. What are the best types of content that work very well on LinkedIn? There are different content types that trigger huge amounts of engagements. Content that create ah-ha moments or reveal something shocking they didn’t know about usually go down well with the LinkedIn audience. How-to posts – these could be tech tips, marketing tips, video tips or even writing tactics etc. Example: 5 ways you can increase watch time on Youtube. Stories of specific incidents that happened at work or at home and the take-aways. In particular, stories revolving around underdogs tend to go viral very quickly. Job hunting stories – how someone who was laid off found a job after 9 months. Lesson learned: don’t give up, persistence pays off eventually. Controversial posts – things to do or not to do on LinkedIn. Example: LinkedIn is not Facebook. Now you’ve got an idea of which content goes down well on LinkedIn, let’s dive into the topic of relevance. How can businesses learn to create relevant content on LinkedIn? It’s all very well to create viral posts. However, at the end of the day, did the viral post help you to achieve your professional objectives? Are the “right” people connecting to you? Are you getting any leads from the viral content? If the answer is no, then perhaps you need to review the LinkedIn content you are putting out on the professional platform. The objectives of creating content LinkedIn are create opportunities, conversations & make yourself visible while establishing your authority. Focus on who you want to attract and what they are most interested in. The “right” people want to connect with you. The “right” people recommend potential clients to you. The “right” people support your business and want to collaborate with you. The key rule of thumb is create easy to understand content, easy to respond and EXPERIMENT. The more you create, the better you get. You can begin by using these as your yardstick. What type of content get more eyeballs? Which content resulted in more shares and interaction? Create ah-ha moments for your audience? Are you targeting a broad spectrum or is it only meant for certain groups of people? Communication etiquette on LinkedIn and what’s the best way to nurture relationships? Put on your best behaviour. The rule of the thumb – never send a message or write a comment that you would never say to someone in the face. If you don’t know a person and you disagree with their opinion, don’t be rude. State your stand in a polite manner and if you can’t come to an agreement, there is always the option to agree to disagree. If you see a post that is absolutely ridiculous and doesn’t make sense, scroll down and ignore those content. Your purpose on LinkedIn is to generate leads, not to pick a fight. There are mainly two ways for you to communicate on LinkedIn – either through your company page where you post updates or on your personal profile. Using your personal profile to lead online conversations is the recommended method to create trust. People love to know who they are talking to – unless you are a well-known household name, using your personal profile to grow your LinkedIn page is more effective than hiding behind your company name. Initiating conversation is easy. Creating the rapport to further the conversation can be challenging. Creating your own content on LinkedIn is akin to the fire starter for a charcoal fire. Let’s say, you want to connect with HR professionals. Publishing content about the latest HR technology, the hottest HR challenge or a solution to improve the HR process would appeal to the HR audience. In this case, the content piece becomes the conversation starter with HR professionals. Rapport is built when there is a common understanding or when someone feels you are providing assistance. Communication wise, tap into public channels like using your LinkedIn company page, your personal profile to publish and share high quality content and your opinion. In terms of nurturing, after private messaging, you can initiate a (video) call or even meet face to face! I’ve nurtured many relationships through LinkedIn and have met many people in real life – when they come to London! How can businesses make sure conversations doesn’t stop after the content is published? Posting content on LinkedIn has become insufficient. Building relationships is a two way traffic. When there is no interaction with your audience, the gap between you and them continues to exist. Connect with new people who’ve liked your content or left a comment. Make notes about what they are most interested in so you can tag them in your future related posts about the particular topic. If you want to be serious about keeping up your relationships, note down the dates where you last spoke to them and set a regular interval to check in and catch up. Here’s also a super lengthy post I wrote on how you can grow your LinkedIn network. Is there a real need for a LinkedIn content strategy? A LinkedIn content strategy is the roadmap to unearth quality prospects that aligns with our ideal audience personas. This roadmap documents content topic ideas that align to the problems of the prospects. A good content strategy shapes the rhythm of the publishing calendar and identifies resources needed to execute the plan. 1. Attract the ideal prospect with additional information or other frequently asked questions around this specific sub-topic. 2. Demonstrate your knowledge and authority in this subject matter by linking to valid sources. 3. Nurture the relationships from cold to warm or warm to hot and of course, push them to take the final step of buying you from you. Accompanying each piece of content is a call to action. It could be asking for an opinion, checking out a resource on your website, tagging one of their connections etc. Each of these actions is meant as an interaction opportunity. In marketing terms, this is also known as a micro-commitment. And the purpose of every micro-commitment is to create trust. And through the trust creation process, inspire a potential strong relationship that will mature into a buy. decision. from. you. What are the advantages of alternating content types? The LinkedIn algorithm is changing all the time. Beginning of 2018, the algorithm prioritized video posts (to boost adoption) after LinkedIn upgraded their entire infrastructure to support videos. Towards the end of 2018, document post updates (i.e. Word doc, PDF etc) were marked as a higher priority on the newsfeed. Right now, LinkedIn is testing out live videos in the United States. You might have been receiving notification whenever someone in your network goes live – even if you didn’t subscribe to be notified. It might seem counterintuitive to alternate your content types. Nonetheless, I still recommend to alternate your content types because some people have more time & prefer videos while a time-strapped professional prefers to read text. But if you’ve limited time, focus on videos & text posts. If you have more time on hand, add in pictures and create documents to share. And from time to time, publish a long form article. Short form article works well as bite-sized content but a long article showcases your thought process in more details. Moreover, most people do have a preferred way of learning, either listening to audio, watching videos or reading. So when you focus to publish only in a single format, some groups of people will be left out! I’ve also recorded a video about this topic and wrote a long article about the best LinkedIn content types. How do I know if I’m making progress on LinkedIn? Firstly, set your LinkedIn objectives – what do you want to achieve on this B2B platform? Do you want to grow your network to nurture prospective clients’ relationships? Are you exploring alternative partnership opportunities? Is growing your company LinkedIn page your top priority? Write them down and be clear with your priorities. Once your goals have been clearly defined, the next step is to outline the route to achieve them. Let’s say, you want to grow a prospective ideal network that will get you referrals over time. First, identify the key attributes. What is their job title or job role? What is their industry or sector? Which country or city do they live in? Which companies have they worked for? Once you’ve narrowed down your list of ideal people you want to connect with, this is the list which you will be using to grow your network. How can a business measure their LinkedIn progress? What do you want to achieve by the end of 12 months? It’s a rigorous process but if you are spending a lot of time on LinkedIn and really want to make sure your efforts see results, tracking becomes important. If you can’t measure it properly and see your progress, then spending time on LinkedIn would naturally become less of a priority. Here’s another article on how to use tangible metrics to measure and extend your success on LinkedIn. Now you’ve a complete picture of the lead generation options on LinkedIn, it’s time for you to grab hold of this opportunity to diversify your lead sources. If you require a guidance on either the paid or organic approach to minimize your spend and maximize your results, let’s talk.